An acoustic neuroma, also known as vestibular schwannoma is a noncancerous growth that develops on the main nerve leading from one's inner ear to the brain. The branches of this nerve directly influence one's balance and hearing. 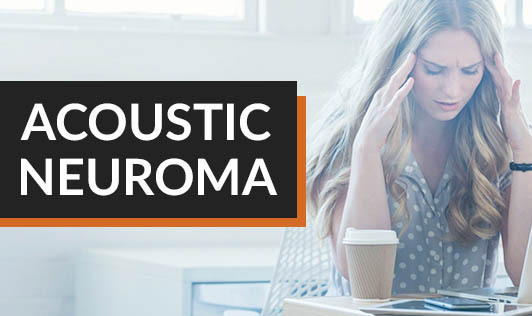 The pressure from an acoustic neuroma can cause hearing loss, unsteadiness and ringing in the ear. The cause of an acoustic neuroma is due to the tumours that are developed on the main nerve leading from the inner ear to the brain. This is probably due to a malfunctioning gene. What makes this gene malfunction isn't clear. An early diagnosis of acoustic neuroma may prevent the tumour from growing big enough to cause serious consequences such as total hearing loss or a life threatening build-up of fluid within the skull. Hence, it's important to contact your doctor if you experience ringing in your ear or have trouble with your balance.